So many of my clients ask me each year how I decide on which trips I will offer and why? My process is this. I listen. I listen to the inner voice within me that is attuned to universal consciousness. I find that each pilgrimage and each journey that I have been guided to offer comes down to something greater than I can imagine and something that is connected to what is happening on a higher level for the greater good of the whole. Another part of the process is to totally trust what I hear. I do ask for signs of confirmation at times. I am always amazed at how these come forth. In the beginning the intricacies of the pilgrimage, the how’s, why’s, etc., I am not immediately privy to. Therefore, I am not always clear on many of the particulars of the pilgrimages. I only know that this is where I am guided to go, with a group of like-minded, heart-centered people. There has been a divine selection and my part of the process is to trust it and know that everything will be revealed in the right moment. Here is what I have come to know for sure: there will be enlightenment, healings, answers, a-ha moments, soul-utions– for these are spiritual journeys of the heart that have been guided and orchestrated for a greater good, for all participants, individually and collectively. Hence this year’s trip to Greece. 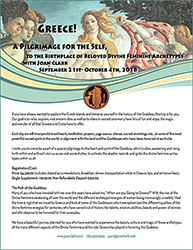 For many years I have wanted to travel to Greece and walk the path of the Goddess: to look at the mythologies associated with each of the different Goddesses/Gods that have been a part of the Greek history– as well as to explore the beautiful landscape of this face of the Mother Goddess. It wasn’t until recently that the time was right. It makes perfect sense to me why now. As we look around we see the rising up of the Divine Feminine: her alchemy, wisdom, as well as her journey from power to silence, and now re-emergence! There is a healing taking place within both male and female– heart and mind coming forth in the spirit of unity. This restoration of the divine feminine presence from the devastation that has been caused by the separation over the years is long overdue. She is unveiling once again her natural powers and abilities to nurture, heal, comfort and bring forth great compassion, forgiveness and unconditional love– as forces of power, balance and harmony in a time where it is so badly needed. The feminine heart has historically been shattered and broken by betrayal, abuse and violation. In this rising up it is also a time of healing the atrocities that have been part of the feminine rites of passage that have taken her essence and presence underground for protection. Greece, has always been cited as the power center of so much divine feminine adoration and reverence. A place where a litany of Goddesses has been revered for their beauty, power, energy, gifts, talents and abilities. It is here where we can begin to activate and open portals for healing that have been silent for far too long. In Greece we can collectively reframe and re-ignite the passions that have been dehumanized by a cultural amnesia that has impregnated the collective consciousness with separation and exclusion– thereby disassociating the female presence from the innate wisdom and divine goodness that is hers. Here in the portals of consciousness aligned with Greece is where we can begin to eliminate and breakdown the destructive energies of control, manipulation, jealousy and vindictiveness that has harmed the very essence of the feminine spirit. As I look at the women around me, and at myself as well, I know that a healing is underway and necessarily so. A massive healing not only in women, but men as well. I see the need for us to not only heal our ability to awaken those miraculous fields of consciousness that will empower once again all that is uniquely and divinely feminine, but also that will heal the union between the many faces of the divine feminine. This is a prayer walk for the healing of the feminine– whether you are a male or female. A prayer walk that will awaken consciousness as we walk upon the earth and as we sit in meditation at sacred sites. An activation of this lost union that has occurred and that will enlighten us at the very core of our being– that will ignite and catapult us forward into a potentially more benevolent future. Together we will take time to remember the exquisite beauty of all that reflects the many facets and faces of woman. Her divinity and her humanity. From the archetypes that we will encounter, the people that we will meet, the ancient sites we will visit, to the land we will embody and embrace. Greece is a pilgrimage that will wake and shake us up. That will help restructure and rebirth the feminine qualities that have been shunned and belittled for far too long. From the archetypical energies of Isis, Aphrodite, Athena, and many more. Together we will traverse the ley lines of the mother’s sacred earth and rebirth, the union of the sacred marriage of the divine masculine with the divine feminine. In the spirit of oneness. I invite anyone who desires to join us for this divinely appointed moment in time– for the awakening and healing, the uprising and the re-birthing of the Divine Feminine– to register now. There are still a last couple spots available. Don’t miss out on the experience of a lifetime! For a full-color flyer detailing this magnificent journey please click here. 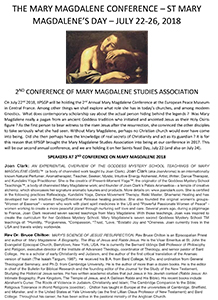 I am delighted to announce that I will be presenting my work with the Goddess Mystery School Teachings Of Mary Magdalene (GMS)™ as leadoff presenter at the Second Annual Mary Magdalene Studies Association Conference in Limoges, France, July 22nd-26th. The program includes esteemed presenters from different walks of life– sharing their work, research and intimate findings– some of whom I have wanted to sit and listen to and now have the honor to do so. The goal of this conference is to gather with others who have been touched by the presence of Mary Magdalene and to share our own personal and professional work with her and her role in the 21st century. The amazing part of this conference is that it will be a moving conference– as we travel to different sacred sites to take part not only in presentations but also engage in rituals, ceremonies and anointings while experiencing the energy of Mary Magdalene. We will explore the land of the Cathars, Montsegur, Alet les Bain, Rennes les Chateau, and the Carcassonne area– all places where Mary Magdalene and her followers continued, and continue, the work of their beloved Yeshua. Since 2003 I have been devoted to following the path of Mary Magdalene and have had the great honor to channel and develop The Goddess Mystery School Teachings of Mary Magdalene (GMS)™. This work is complemented by my Mary Magdalene Perfume Essences™ line– a private collection of signature fragrances/anointing oils of my own creation, intended to take the work to deeper levels. I have been fortunate to share and teach this body of work with many other people across the United States and abroad. It has been my passion and mission for the last 20 plus years. I have been extremely blessed to be able to create community with others who are on the same path, some who are just beginning their journey with the divine feminine essence through the archetype of Mary Magdalene. Upcoming Releases: I have recently completed The Mary Magdalene Daily Devotional© and The Goddess Mystery School Teaching Workbook©, part of the above-mentioned year-long GMS study/certification program. Both of these look to be publicly available in print beginning in January, 2019. And I am putting final touches on the tale of my personal journey of 20+ years with Mary Magdalene– entitled In Her Name©. It brings my heart great joy to be able to share this work with others devoted to the awakening of the divine feminine through the face, voice and work of our divine Mary Magdalene at this conference. If you are interested in hosting a Magdalene gathering/workshop in your area, please contact me.>/em> I believe it is time for Her work to come alive within us all. She is the Goddess of the 21st Century. She is awakening. She is rising. She is here. Please Click Here to download a pdf of the Conference Programme! How many times have you stood in front of the mirror after spending hours in your closet trying to find the perfect outfit just to find yourself un-dressing and starting over? Taking off those big new earrings that you bought because you don’t want to draw attention to yourself? Growing up… one of my favorite moments of the day was watching my mother wander from drawer to drawer and from outfit to outfit trying to decide how she wanted to express herself that day. My mother loved the art of dressing her body. Depending on her mood, where she was going and whom she would be seeing– all was part of the process. In her mind she was set to be the focal point of the gathering– not unlike an art piece in a museum. She wanted to be lavished and anointed with praise, to be devoured and appreciated and honored for her unique style, beauty and sense of panache. As just one component of her individuality and essence. She loved spending hours primping and making sure her clothes were meticulously cared for, from a place of loving attention and pride. From her shoes, purse, gloves to her under garments. All were coordinated and went with the outfit for the day, occasion or intimate moments of which she would be a part. So many of us spend endless amounts of time, energy and money on trying to find that look, that style that will be uniquely our own; and then when we do, we find ourselves staring in the mirror and wondering if it feels safe to fully express ourselves in such a creative way. What will others think? Will they make fun of us, shame us, and make us feel uncomfortable? What, in this day and age, is appropriate? How often have you gotten ready– felt really great about how you look– and had someone ask, “That’s what you are going to wear?” Causing you take another look in the mirror and question yourself. Is it too much, too large, too sparkly? Then witness as you begin to feel uncomfortable and watch your confidence and attitude plummet? The next thing you find yourself doing is removing that new red lipstick you wanted to start wearing, taking off the low-cut shirt that you feel may now be a little too revealing, or removing those fabulous new earrings you purchased because you wanted to tailor a more bohemian presence to your look for the evening. The ruminations escalate into the worst-case scenario and here you step back from your heightened sense of self and power and revert to the old status quo– which is safe. The pattern for so many of us is to then defer those insecurities– back to familiar feelings of not wanting to own our own beauty, power, creativity; our own authentic style, passion and voice. And this becomes part of our continuing shame. Or on a deeper level it may be we don’t really feel safe in the world. We may not know how to handle the stares, compliments, comments, and flirtations that can come along with being noticed and standing out in a crowd. In a world where we as women are being asked to own our power, beauty, creativity, intellect as well as our ability to be financially prosperous, it is imperative that when we stand in front of that mirror and embrace what we see before us. As we are claim our part in the new uprising of the divine feminine, we become each other’s Wonder Woman– mirroring to each other powerful visuals of warrior-priestesses proudly and powerfully shining our own unique gifts, talents and abilities. What would it feel like to own and become the leading ladies of our own lives and to have written in herstory that we were queens of our destiny? The complete Aroma*Woman line, and specifically our signature Aroma*Woman and Aroma*Power offerings, are fragrances which have been created just for those moments when we– as women– may not feel the confidence or courage to stand in that power… and need just an added bit of support to do so. It has been documented and we know intuitively that scent creates memories and can serve as a powerful energetic affirmation– communicating to and anointing our consciousness; shape-shifting how we feel and experience what is happening around us. 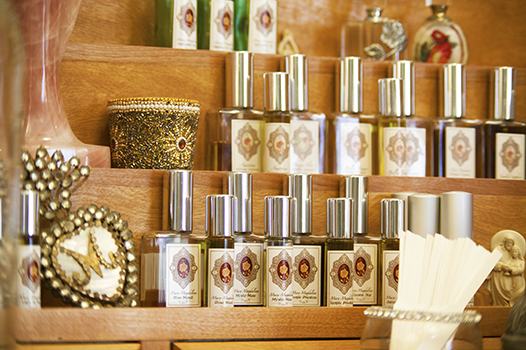 Natural fragrances can help us move more fully into the magnificence that we have come to infuse into the world. What greater gift can we give ourselves than to harness the confidence and fortitude to feel safe in our lives– free in own bodies and to express our full feminine presence? My mother had no problem with this. I guess she may on some level have been the Wonder Woman of her own life. She was truly empowered in her own authentic femininity. She loved being worshiped and relished in that subtle power that fed her spirit. As the young women in this generation are being initiated into the new female archetypes of the 21st century it is up to us to exemplify those characteristics they are working toward embodying: women who acknowledge both their warrior side as well as the feminine side. Women fully confident in their skills and abilities and who can rise up and be equal to any man and challenge that comes their way. The next time you stand in front of the mirror and consider taking something off because it just may cause a little too much attention; when feeling you would like to add a little pizzazz to your look, and sensing a bit of fear rising up due to this unfamiliar sense of personal empowerment… I encourage you to go for it! Think about the varied role models of the day. There are no outlines or rules you have to attend to. No one you have to apologize to for wanting to strike a different pose. No fears that you have to surrender to in deference to your desire to allow your own creative, authentic self to be fully recognized. The common exemplary quality of those who serve as our heroines is– a quiet confidence which emanates from she who knows herself. It’s time to not only be bold, outlandish, and step it up a notch… it is also the time to shine as brightly as possible. Tough times require this. Walk firmly and proudly, and spread a little of your feminine authority, beauty, poise, and presence around! And just in case you need a little back up—place those hands on your hips, call forth your inner AROMA*WOMAN– put a drop or two of your Aroma*Power synergy in the diffuser, anoint yourself with the shield which is your Aroma*Woman fragrance, and fully embrace the Goddess that you are. The world needs you… Aroma*Woman! I write this to you as a warning to not let the fear that has begun to be spread and surround our work affect you from using with wisdom, care and knowledge our tools– that are the plant spirits. The fear that is being injected into today’s news is directly because of large multi-level marketing companies looking only for financial gain, and recklessly not training their “distributors”. Their practices are disturbing and causing separation and actual (yet easily preventable) harm: once again putting our work under undue scrutiny which may take away our freedom to heal with the plants. These companies and their affiliate sales forces have not invested time nor felt it was needed to offer full educational certification and training in the use of plant spirit medicine. The quality of their mass-produced quantities of oils are suspect. They have placed their value, time and energy in building financial pyramids but have not built educational foundations to support them. This is irresponsible. We are at a critical moment in our work as Medicine Women. We are being asked to rise up and be accountable for protecting what is ours and what we have come to do as healers, visionaries, modern day mystics and plant spirit alchemists… as opposed to salespeople hawking what they believe to be the next catchphrase or fad! No one has the right to tell us what we can plant and how we can use it– when done with reverence, wisdom and knowledge. No one has the right to take from us a living based in integrity and commitment to the oath that we take from the moment we place our hands on the earth and we begin our long intimate journey with the plants that only desire to offer wholeness and health– to Do No Harm. And we must prevent such from occurring. Every one of you in this group has the common sense, and the educational training to know that when used with respect, knowledge and wisdom the plants of the Mother are here to help heal us in so many beautiful ways. This is not the path of the Medicine Woman, Healer, Teacher, Visionary. Ours has been the way of a lifetime of the accumulation of wisdom. What if we had people peddling other careers, promising, “Come on and get your law degree or MD p.d. quick, and become that lawyer or doctor”? What kind of havoc would that create? We have seen case after case where poor education and the lack of understanding of the chemistry of the plants have done harm; and the results have been truly unfortunate. Those that have been harmed are speaking out against the use of plant spirit medicines. All this is avoidable. We know that the plants can cause harm when not fully understood and applied responsibly. There is a state of emergency unfolding with all the harm being done and it is causing much chaos and scrutiny in our industry– which may eventually lead to restrictions and perhaps even the legislated absence of our tools. Therefore we are being called to be adamant about proper educational training and raising awareness to the multi-level marketing schemes that promote the bottom line but do nothing to fully educate those whom they entice to enroll in their company. It was not so very long ago that women who worked with the plants and made healing balms, who listened to their intuitive voice and healed the sick were chastised, harmed, killed or sent into hiding because of outside forces projecting fear and accusing these women of doing harm. We do not want to go backwards to times where we had to hide this hallowed work. And so we must search our hearts and souls and truly define the purpose of our work with the plants. For they are precious gifts and are to be used with care, integrity, wisdom and knowledge.Be mindful. Do no harm. Ask questions if you do not know something, Use our motto of one drop at a time: do not use directly on skin unless diluted in a safe carrier oil and do not take essential oils internally. We administer– with love and wisdom– plant spirit energies that have been used for centuries to balance the body, mind, soul and spirit. We are Medicine Women and we will not allow fear, greed, or mistruths to control our knowing and our work. We shall never sacrifice quality of tried-and-tested all-natural ingredients in the name of cutting corners for gain. We exercise these ways as our spiritual/religious freedom– claiming our personal power, expression and choice to do so. Please do not be afraid of the plants and using them… wisely! Bless them, and allow them to guide you; and when in doubt, seek advice. Let us place our work in the hands of the Goddess and may those energies that are not in alignment with the highest be released so no harm can be done. I am a Medicine Woman. The plants are my sacred tools. And I will protect my rights to use them for the good of all, and to do no harm. A Blessed 2018 to each of you! I am excited about 2018. Mostly because last year was a real wake-up call for me, and I believe it is fair to say many of us. I know I have had to step back and learn how to really breathe and let go. Let go of judgment, expectation and the way I have been taught things should look, be and unfold. I have come to terms with the expression– let go and let Spirit. Let go and let Spirit! Trust in the higher plan. Trust that this too shall pass. Trust that everything is in divine right order. I am doing my best. I think we all are. So, my hope for 2018 is that as I am letting go and trusting a higher power to pave the way forward for us with grace and safety, that others who are of like mind and spirit are as-well. In that knowing I can see a light at the end of the tunnel. I can see the process of release happening and what I am finding out is this: I have more time for the things I love. I have more freedom because I am letting go of attachment to things I have no control over; and it is glorious. It is why this year– instead of writing New Years resolutions– I wrote up a list of things that made me happy and things I loved to do. I made a commitment to myself to do more of them this year, now that I have time to do them. Now that I am not micro-managing things– that were and have always been out of my control anyway. So this new year I am going to play more, create more beauty, dance, sing, and travel more. I am going to be around people I love more. I am going to relax and read a book and sip tea and take long aromatic baths. I am not going to fret over what I think I should want and be doing but be fully present in where I am at and give thanks where I am. I am going to trust that while I am having all this fun, that everything is in divine right order and when I am called to step up, I will. But until then it is up to me to create anew. I am the change in my own life. This year at Joan Clark’s Palais Aromaetica we, too, are going to embrace our gratefulness even more that we get to play in the lab, create new fragrances, travel, teach classes and workshops on topics that we love and that set our hearts on fire with passion. We are going to realize the importance of union and connection in a more deep and powerful way and we are going to allow the gifts of the Mother to help us trust– that with each drop, with each moment we are being blessed with our work… that we are blessing others as well. We look forward to being there for you and with you. WE are co-creating this new aromatic lifestyle together. Here’s to a Magical 2018! Spruce Up Your Man this Father’s Day with all-natural fragrance from the JC Men’s Line– because every man should have a little bit of Earth on him! Fragrance is the most intense form of memory. This Father’s day we invite you to create some scent memories with one of our amazing all-natural Fragrances for Men. 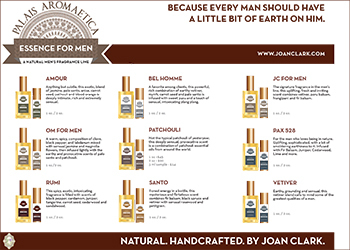 Our men’s line is diversified, elegant, sensual and full of all those scent-sational fragrances from nature herself. Choose one of our fragrances to celebrate the men that you love in your life this Father’s Day. 20% Off of all Men’s Line fragrances through June 30th. Just use discount code: FATHERSDAY17. Some days we feel like life is just too much to bear. We ask ourselves— When is this going to end? When will things feel better, get better, when will I feel like myself again? You are in a wonderful place. Break-throughs not break-up’s. you just judge one as better than the other. but in the moments of extreme darkness. thereby allowing for renewal and rebirth to unfold. 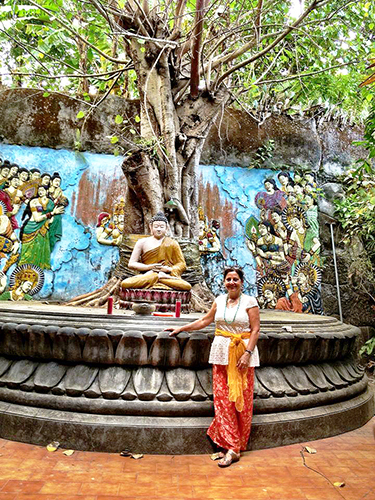 In kundalini yoga there is a beautiful mantra that we chant that helps embody the glory of the processes of life as it is –Sa Ta Na Ma — the syllables of which mean I am birth, life, death and rebirth. This is what life is. We are all in the Sa Ta Na Ma journey together. Doing our best to see our lives as a holy process. Sacred moments linked together not only in joy– but in pain of our own separation from the oneness. Be here now. Be present, stand firmly and enjoy the pain, the sorrow, the ugliness, the sacrifice, and then wait for the light–for it will come. It has to. For a spiritual promise is upon all of us. The light is on its way. Be here now. Let your life get messy, let your self embody all of life’s cycles and seasons and enjoy the process of living. We are all part of the Sa Ta Na Ma. Brrr… It’s Cold Outside! — Vital Energy To the Rescue. The transition from Winter to not-yet-Spring is the time of the year where we find ourselves coming down with colds and flu-like symptoms, if we have not taken care of ourselves; and when life stresses have just taken a toll on us. Whenever your body needs aromatic support our hope is that you will snuggle in, stay warm and use a little bit of aromatic alchemy from our Aroma*Essentials apothecary to assist in keeping your body, mind and spirit feeling uplifted, energized and healthy. 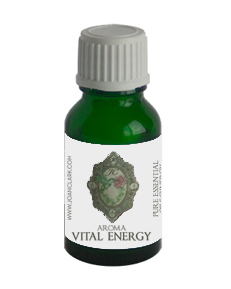 Our Aroma*Vital Energy blend is our emergency care synergy that brings relief and support when your body, mind and spirit need some Tender Loving Care. It is rich in essential oils that will help support the immune system and ward off viruses that may be lingering in the air and attacking the body. Aroma*Vital Energy contains cinnamon, clove, eucalyptus radiata, oregano, saro, rosemary and a few more energy balancing oils to help your system come into harmony and balance. Diffuser— Place a few drops in your diffuser and allow the essential oils to begin to help you breathe deeper and feel more centered. Inhaler— Place a few drops on a blank inhaler and use as needed throughout the day. Room Mist— Place a few drops of Aroma*Vital Energy in a spray bottle mister, in some Peppermint, Eucalyptus or Lavender Hydrosol, along with some distilled water, and shake well. Spritz to refresh, by way of clearing your environment and uplifting your energy field, during the day. Foot Rub/Soak— Make a foot soak blend by placing a few drops of Aroma*Vital Energy in a tablespoon of carrier oil and gently massage into your feet, and then put some warm socks on; or rub onto the feel and soak your feet in some hot water– allowing the essential oils to penetrate more deeply into your body. Body blend— You can also make a body blend by adding a few drops of the Aroma*Vital Energy Synergy to some carrier oil and massaging it up the spine, pads of feet, neck, chest and back area, then soaking in a tub. Drying brushing the skin first will help the oils quickly into the system. I personally like to use the Aroma*Vital Energy in the shower. I dry brush my skin, apply the Aroma*Vital Energy body blend and then let the hot water help it to penetrate more deeply into my skin. After my shower I re-apply the body blend so it can support me during the day. And… a Featured Item through this season– with 20% off through April 1st. Just enter discount code VITALENERGY17 at checkout! Welcome to my home of scent, specially crafted from the yields of the world’s best fields– for you who have been cultivated to appreciate the sacred palette lovingly and magically captured within each blend of every one of my lines and collections. As Nature reveals so many nuanced layers of expression, in proportion to the mindful communion devoted to Her; so a perfume must reveal itself in the same way. Each scent has a story to tell if one will take the time to indulge in its full expression. So few do, but this is why you have come. As with so many other classic works whose depths have not been fathomed, too many perfumes have been evaluated and discarded on the initial inhale, by those lacking the breadth or sophistication to wade deeper. This is why most perfumes have such short shelf-lives. Their complexity is not savored upon first meeting in a manner which allows their secrets and the wisdom of their composition to unfold, their stories to be told. For me each great fragrance, each creative design has a message. It is a holy encounter of all the elements which have melded together to create a form greater than the sum of their individual parts. Each ingredient– a muse from its corner of the world– meets the others; and together they join to create something grander and more powerful for the lucky person drawn to it and savvy enough to remain present for the revelation. For this reason I work only with natural products, sourced via relationships with growers of the highest integrity. Many times the fragrance floating around in my mindscape comes from working in the garden or my art studio or out of my travels throughout the world. I create for the pure bliss of creating and I share these creations with clients, friends, family– anyone who happens to appreciate a whiff of mystery. I create fragrance because my spirit has to be connected to nature. I create because I must. As a writer must write, a singer must sing, a dancer must dance, a painter must paint—a perfumer must create fragrance. These are the sensory tales I tell, the webs I weave. These are my creative expressions of soul and spirit merging into matter. Here I attempt to honor the gifts of my passion– which in turn hope to inspire you onto such honoring of your own expressions– such that we each may give back to the universe, in gratitude. And so on, and so on, working under the intention of elevating our world to divine stature. Sure you can find cheaper oils and blends from mass-marketed companies or individuals comfortable with cutting corners. What I hope you will find here are products birthed from love, intention and experience that make Palais Aromaetica one of your first choices when looking for integrity, design, purity and originality. I invite you to wander through this temple of creative artistry. My hope is that you get a taste of the magnificent beauty available here, as well as of the art and pleasure of designing, donning and spreading aromatic alchemy throughout the corners of your world. I am happy to announce the coming out party of the new www.joanclark.com, and to welcome you to what I hope you will find is a joyful, beautiful place of sacred sensory overload! We have labored (for way more than nine months!) to redefine all of the tools, gifts and creations I offer, in support of your most passionate and fulfilling lifestyle and mission. There have been numerous growing pains. We have torn into our “closet” and thrown out anything that no longer fit or which didn’t flatter us. And as the dust settled, I truly believe the work has been elevated to a higher, more cohesive, more systematic level. These times require constant rebirth, and a honing and harmonizing of all we do, into larger and more empowered frameworks. * 7 product lines!— Women’s and Men’s natural fragrances, subtle aromatherapy in the form of the Magdalene and Chakra collections, The Pet Alchemist natural petcare line, and the culmination of a complete lifestyle program I have been crafting for many years– The Aroma*Essentials Body Therapeutics line, and its daughter/subset, the Aroma*Woman Synergies in support of all the stages of the divine feminine cycle and rites of passage. 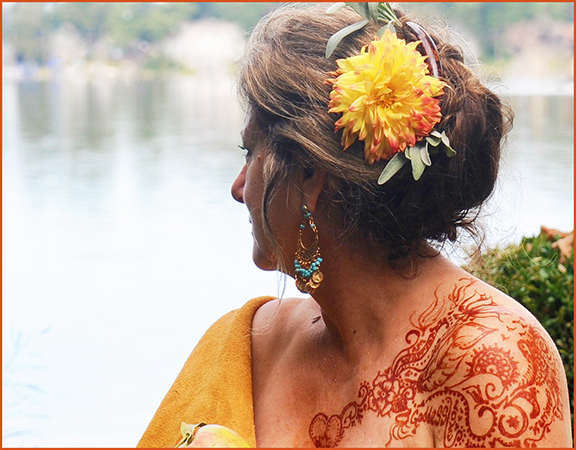 * An increasingly cohesive curriculum of empowering classes/workshops/retreats for the goddess in each of us. * More sacred travel and pilgrimages to fuel the soul– intentional pilgrimages infused with the desire to take us deeper into the mysteries, allowing us each to come more and more to “know thy self”. 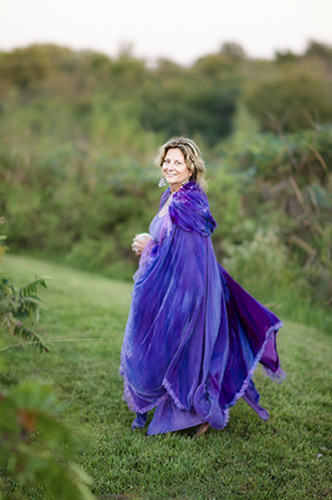 * A full complement of healing treatments, readings, healing sessions to help release past traumas and stresses, and in honor of your larger dreams and visions. * Channeled and intuitive pieces of Joan of Art and more– paintings, prayer shawls, heart rattles, the Moon Goddess oracle deck, Be the Messenger goddess wear. We have toiled to design the new iteration of this site, toward the ultimate user experience. Ease of navigation— your first click should get you where you wish to be. Expandable Read More feature– pages are designed with minimal need for scrolling for returning clients; and those of you wishing to immerse yourselves deeper into the experience– just click on the “Read More”! Fresh Design— it is our sincere hope that this site serves of an uplifting experience whenever you need it– through the addition of lovely images (some graciously provided by sister goddesses), thought-provoking quotes, etc. Goodies— beyond our hope that you will embrace and support our products and services, here we have also included a number of free resources– news of free prayer circle, LunaBella Labyrinth, downloads, etc. I hope you will find this an easy place to visit, and learn about all that is aromatic through my passions and work with plant spirit medicine and it’s alchemy. It has not been an easy journey creating this site for myself. I have had to deeply immerse into why?, how? and– are you sure? moments, as to whether all served the highest moving forward. Why are you doing what you do, how are you doing it and are you sure you want to still do that? There comes a time in your life when you begin to question if you still are passionate about what you are doing. Are you doing it with integrity, grace, flow and ease? Are you creating from a sense of survival or are you thriving and still growing? What is it that you can let go of; what is it that no longer serves you? How do you really want to spend your time? I am passionate about everything which remains on the palette which is this website. From creating and designing products in the arena of natural perfumes, pet care products, aromatic synergies; to sacred travel, teachings classes and workshops on yoga, Aroma*Fitness and more; having a private healing practice; making art. These all are different aspects of myself –and places that my spirit, heart and soul need to take part in to feel I am being of service, as well as sources of feeding my own creative spirit. One of my most favorite words is– Arete which means, in Greek, achieving excellence of any kind: be that creative, spiritual, moral, physical, etc. Embodying the source of a higher alchemy that is in all of us– the higher self that moves us to those things that we have been called to do. Exercising those gifts talents and abilities that are uniquely our own that awaken our spirit and feed our souls. That which inspires change for the better in one form or another… can bring a sense of joy, happiness, and inspiration. What I hope you will sense, feel and connect with within these updated pages of joanclark.com is– my spirit, striving toward its personal best, that wishes to be a part of a greater alchemical force for joy, happiness and good will. I hope these creations and the energy and intention behind them may assist you on to your own inspirations, so that you will continue to touch those in your world; and that all just come to dance here in these possibilities together. Be it through the alchemy that begins to work its way through us by way of sacred scent, the paths we may walk together on journeys to special places, ideas that begin to inspire us in empowering classes and workshops, or through pieces of channeled art birthed from love… all here is created to inspire, elevate, and awaken the heart and spirit of anyone drawn to this body of work. I welcome you to Joan Clark’s Palais Aromaetica— a temple of creative alchemy. Thank you for your support and loyal patronage.